Don’t Fear the Pumpkins Are Here! 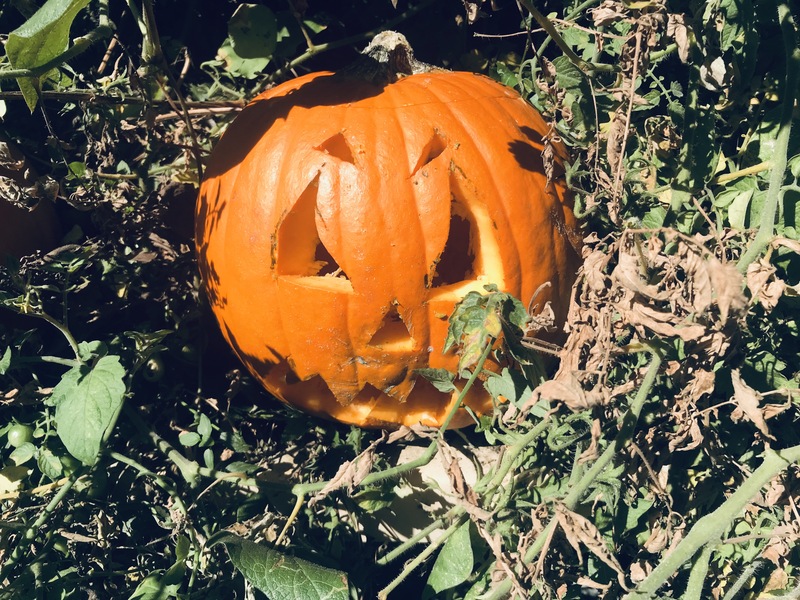 When pumpkin season rolls around a classroom is starting to settle into the familiar rhythm of the academic calendar. Students, parents, and staff have gotten to know each other and the task of learning can begin in earnest. 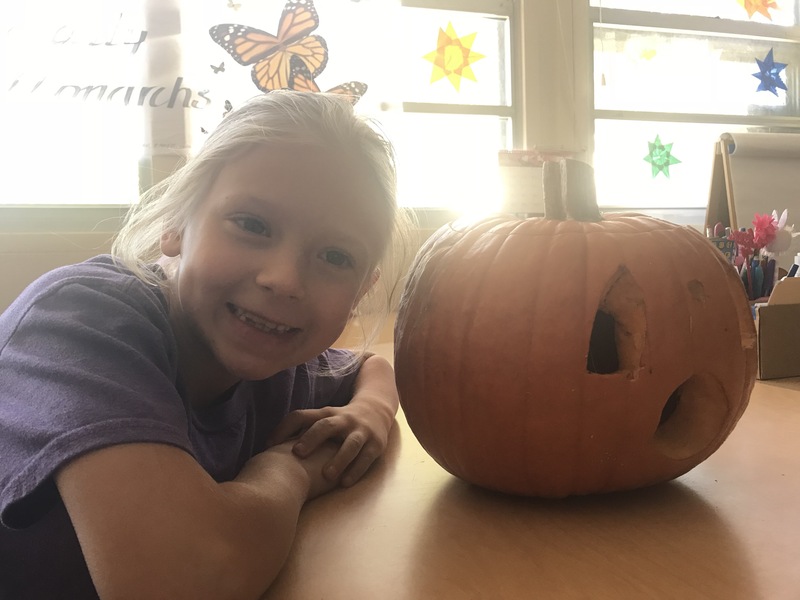 What better way to celebrate than having a Great Pumpkin Challenge. 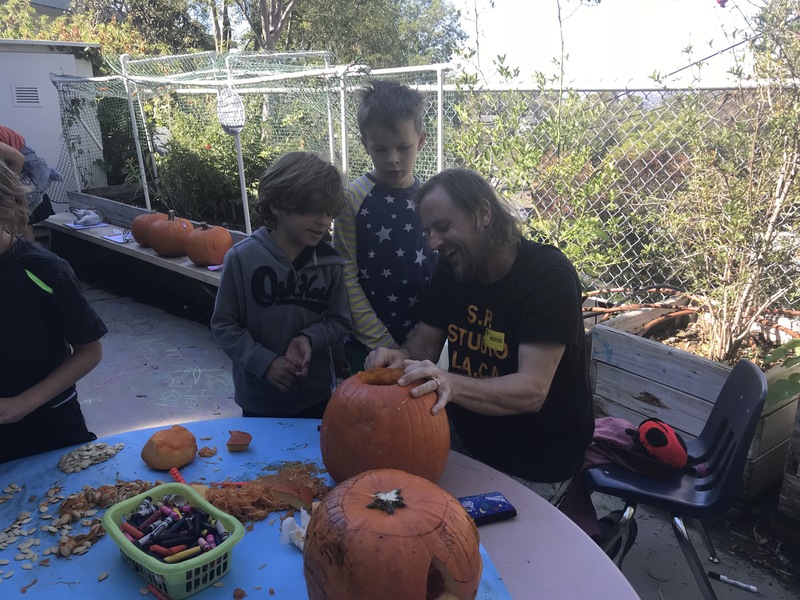 Second grade and our transitional kindergarten invited parents and lots of innocent pumpkins to find an answer to one of life’s great mysteries: how many seeds are in a pumpkin? Second grade is learning how to capture small moments by using sensory details in their writing. 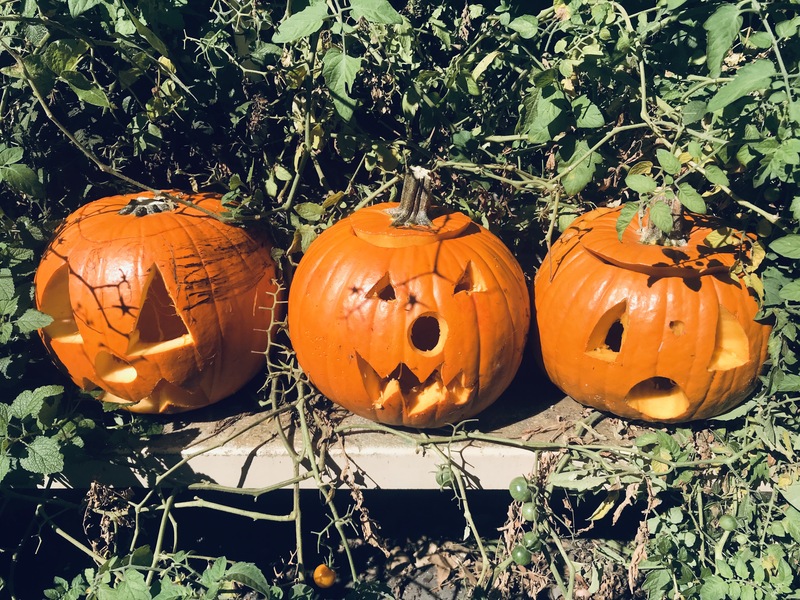 Carving pumpkins and counting seeds is a perfect vehicle to explore our senses. The kids helped scrape, cut, and tear out the pumpkin guts. They noted how squishy and slimy the inside of a pumpkin can be. The stem turned out to be rather prickly. 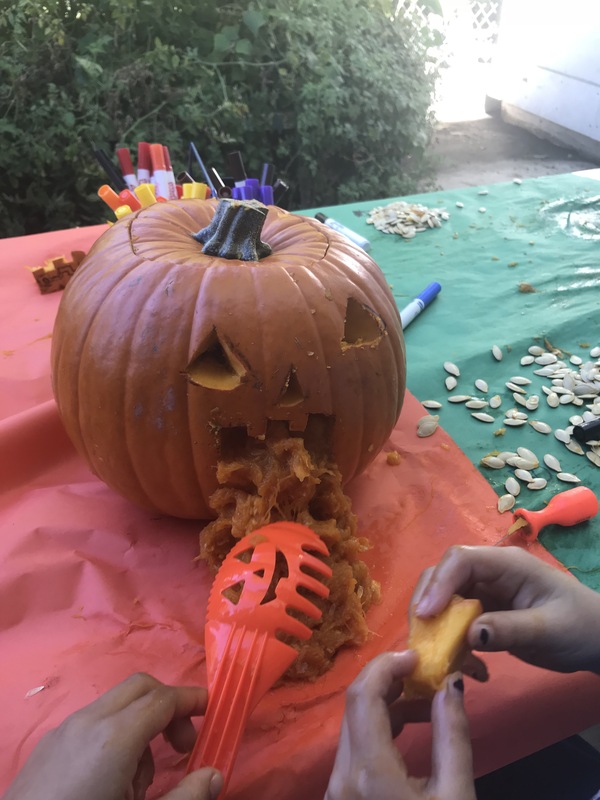 We better not describe the smell, some of the pumpkins got sick. Always wash your hands before carving! How do you count pumpkin seeds? Do you group the seeds by 1s, 2s, 5s, or 10s? There is no wrong way to count! Students explored and shared their mathematical thinking while having fun. You might have heard about cognitively guided instruction (CGI) and counting collections if you would like to learn more click right here. The winner of our counting challenge came down with an impressive 540 seeds. The range was 101 to 540 seeds. The mode turned out to be around 455, which also was the median! Maybe most pumpkins have around 455 seeds? We also learned that a pumpkin’s seed count can be predicted by how many lines the pumpkin has on the outside (Shhh! Don’t tell the first graders). The students now got to carve the pumpkins. Just like there is no wrong way to count, there is no wrong way to carve a pumpkin. The masterpieces turned out as varied as the many characters that make up our diverse school community. Have no fear the pumpkins are here! As you have probably heard, the chickens are here! After 22 days in the incubator the big day had finally arrived. When we entered the classroom in the morning there were two beautiful black chicks in our incubator. Their feathers were already fluffed up. They probably hatched late at night. The next arrival came at about 9am and another one at recess. 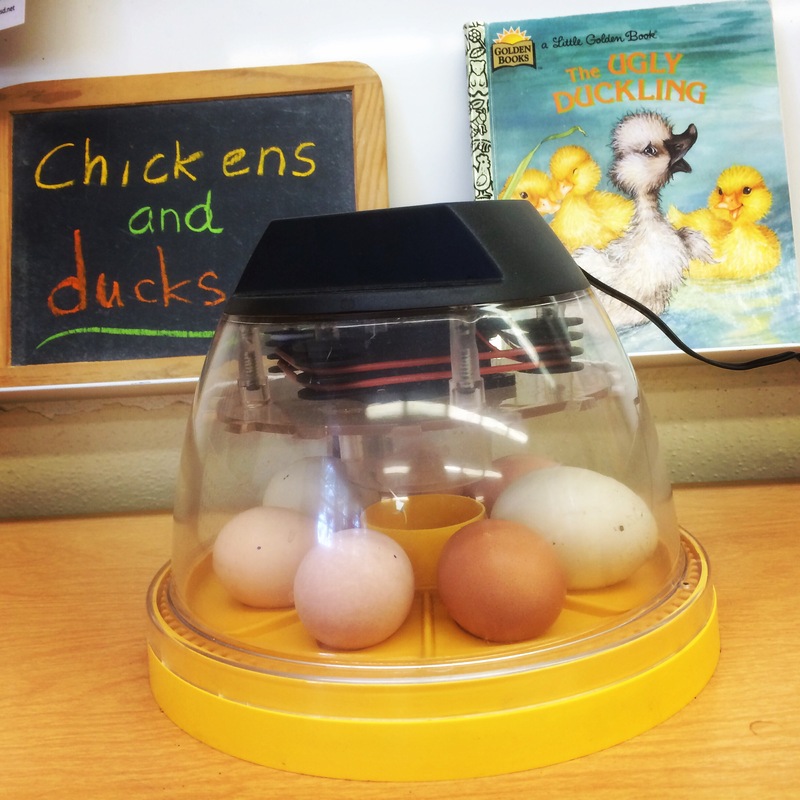 The class had been very worried because on day 14 the incubator was left open while the class went to the Zoo. This left the eggs without heat for more than 6 hours. After candling the eggs it was only clear that the ducks eggs were still alive. Ducks swim in their shells and move around during candling. Day 21 came and went without any chicks hatching. Finally the first little hole appeared and we could hear the chicks chirp in their eggs. We sang to the eggs and they started rolling in response. At this stage it is very tempting to help the chicks hatch. However any interference is usually fatal. It took all of our restrained not to open the incubator. After 2 days of struggling they all made it safely. Welcome to the Blue Planet little guys! Now it is time to observe chick behavior. Our chicks cry for us when they are left alone. They seem to like music and are very curious. 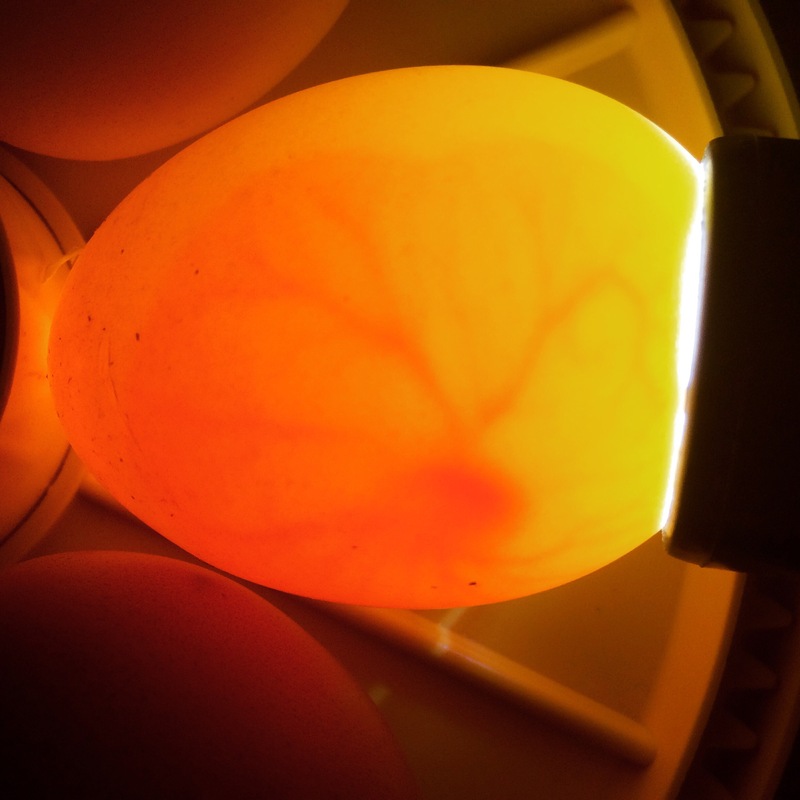 Chicks are not supposed to eat or drink in their first 24 hours after hatching. Apparently our little guys didn’t get that memo. They started pecking on their feed right away. Presumably half of our chicks will be roosters. If you or anybody you know is looking for a hand raised rooster, we might have two for you to choose from. Stay tuned for updates! On Friday, the third grade (Room 14th) made a fantastic Fava Bean and Pancetta Bruschetta with the Fava Beans that they grew and harvested themselves. Everyone took turns and had a hand in each aspect of preparation. They were all eager to participate and excited to try the final result, especially once the pancetta and garlic started cooking! The fragrance wafted through the yard bringing more than one curious (and hungry) onlooker out to see what was going on. Once the treat was finished, they invited the other two 3rd grade classrooms to come out and share the deliciousness. It was a huge success, as there were many requests for seconds and declarations of the “best thing ever!” Ask your child how they liked it. 1. Heat half the olive oil in a large sauté pan over medium heat. Add the pancetta and garlic and sauté until fragrant, about 5 minutes. 2. Add the favas, season with the salt and pepper, and cook until the beans are tender, 6 to 8 minutes. 3. Meanwhile, drizzle the remaining olive oil over the bread slices and toast in a 450°F oven for 5 to 6 minutes. 4. With the back of a fork, mash the beans in the pan until the mixture is chunky. 5. Spread the beans on the toasts and top with the pecorino, if desired. The class of 2027 has been working hard to become a Monarch Butterfly Waystation. For Earth Day we are now asking every school in America to do the same ! The National Center for Education Statistics reported that in 2009-2010 there were 98,817 school in the United States. If every school becomes a Waystation, the Monarchs will have enough food for their migration North. Monarch Watch offers all the resources you will need. It is relatively easy to get potted milkweed at your local garden supply store. 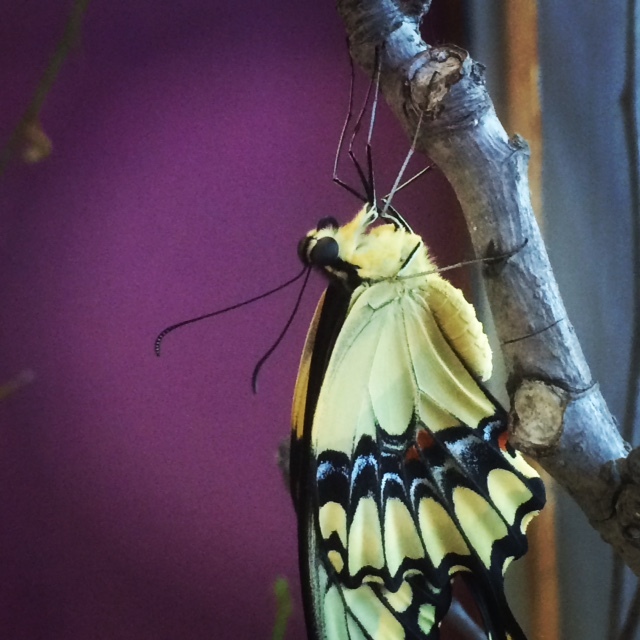 Our school grew milkweed from seed and you can read all about it right here. Monarch Watch will certify you to be an official Waystation with only 6 plants! This caterpillar is about to make a chrysalis in our habitat. If you plant it they will come. Monarchs can smell milkweed from up to 3 miles away. You will soon be able to observe the monarch life cycle in you own yard. Our class also keeps a plant in the classroom and the kids got to see all developmental stages up close. There is nothing like holding a monarch. 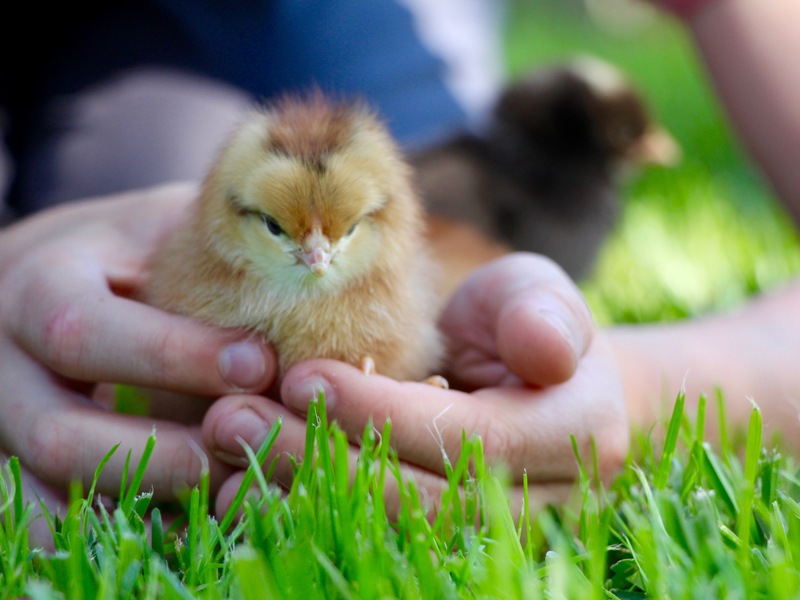 They are surprisingly easy to handle and will happily rest on a child’s hand. You can even mark them with a tag before setting them free. Tagging kits can be purchased right here. 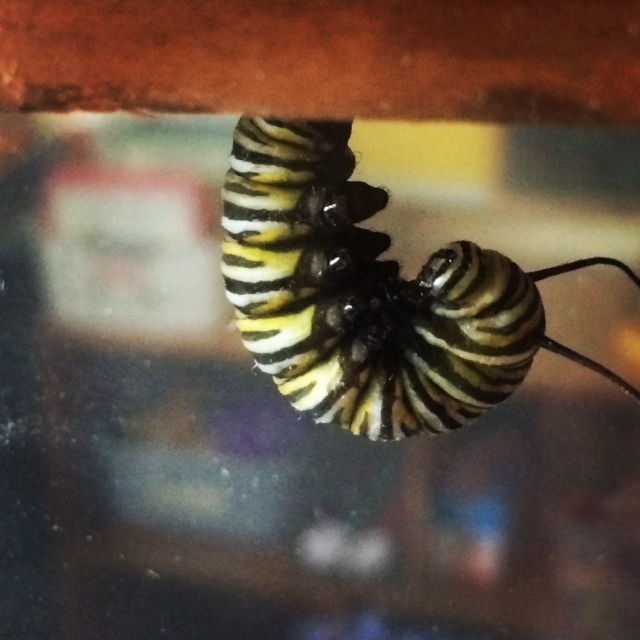 A monarch emerges in our classroom. He will rest and pump his wings for several hours before he is ready to be released. Your class can also help collect data for the United States Department of Agriculture’s Forest Service. Every monarch sighting will help provide important information. Gathering data is an important component of the scientific method. What are you waiting for? Join the our school and become a Waystation! The monarchs thank you for your hospitality. 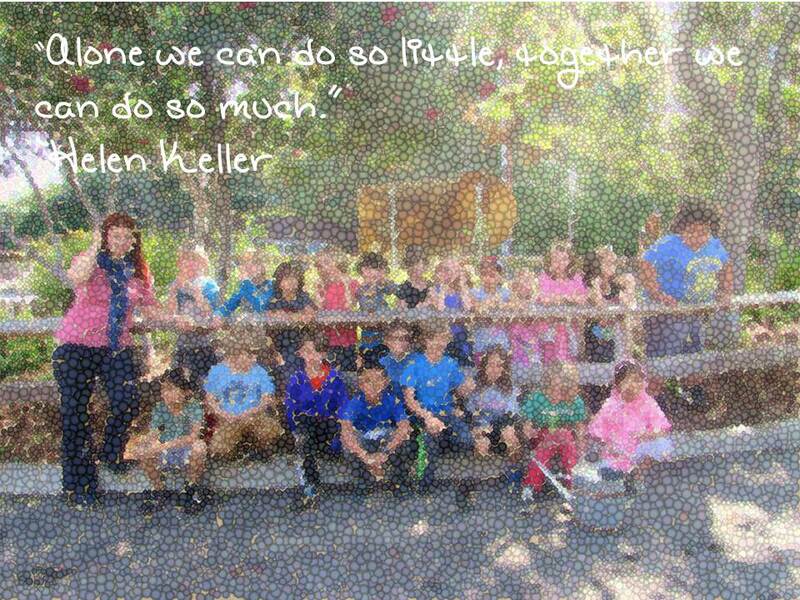 Click here to learn more on how you can help with our school garden. Mt. Washington School Garden is an affiliate of non-profit organization Friends of Mt. Washington (FOMWS).